The best bang for your buck! 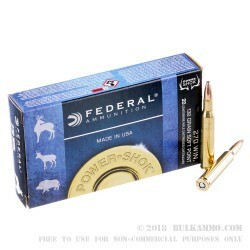 Federal Power-Shok delivers affordably-priced hunting ammunition that doesn’t skimp on quality. 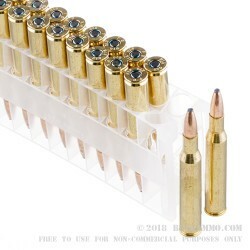 These .270 Winchester rounds feature a 130-grain jacketed soft point projectile and are capable of a muzzle velocity of 3060 FPS. 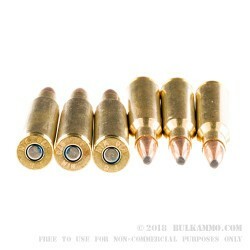 Great for a variety of situations, these rounds are loaded into noncorrosive, reloadable brass cases and are boxer-primed. The soft point bullet provides reliable expansion, accuracy and terminal effectiveness against Whitetail deer, boar and other medium-sized game, while being price affordably enough to use to sight in your favorite hunting rifle as well. 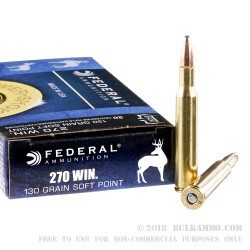 This bulk pack includes twenty, 10-round boxes of Federal Power-Shok .270 Win ammunition. From their headquarters in Anoka, Minnesota, Federal has forged a reputation of reliability and performance. For nearly 100 years, this American- made manufacturer has been on the cutting edge of ammunition technology and continues to be a world leader in self-defense, hunting and target ammunition.